This computer is a Canadian built machine, called the "Hyperion", built by Dynalogic corporation. 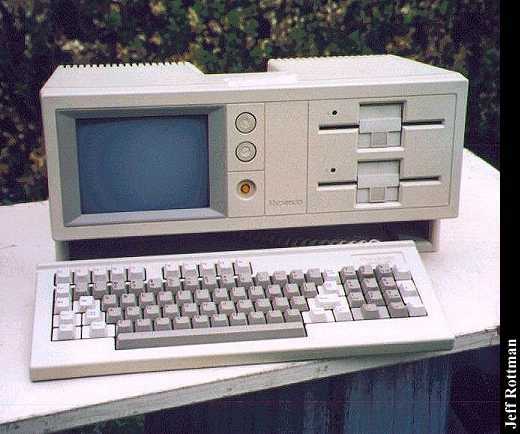 It is an MS-DOS portable machine that includes 2 near full height 360K Floppy drives and a built in 5 inch amber montor screen. 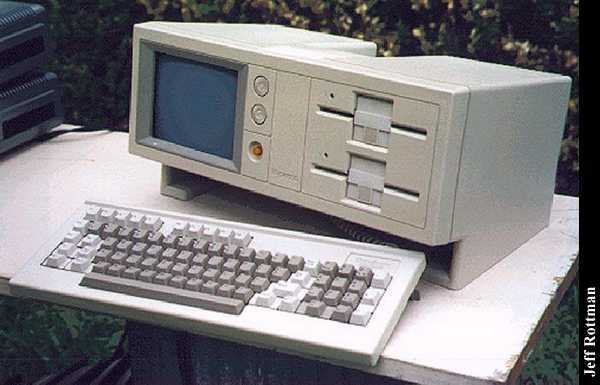 The computer comes with 256k ram and includes a serial, parrallel and an expansion port on the rear. The keyboard slides in under the main unit for carrying and it comes with a nice padded dark blue carrying case. When this machine was being advertised in the magazines, they were bragging how easy it was to fit under an airline seat. I have successfully run MS-DOS 6.0 on the machine, although it was usually bundled with a special Hyperion version of DOS 1.25 when new. The screen can emulate both a Hercules or a CGA monitor in shades of Amber. It also included some bundled software for business, and DOS. I believe it was being sold in the mid to late 80's. Click here to view all comments for the Dynalogic Hyperion and to leave your own. Click here to view comments about other Dynalogic computers.